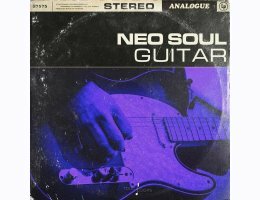 Neo Soul Guitars is an exploration into the inspiring guitar fueled world of Neo-soul, Jazz, RnB & Hip-Hop. Recorded, produced and mixed by the stupidly talented session guitarist Artiom Krikunov, this truly original and unique collection of neo-soul guitar loops will form the bedrock of your next great composition. Utilizing a stunning all analogue signal chain across a range of classic electric guitars & amps, you can expect to find lush chord progressions, head nodding soul licks, beautiful lead work and incredible hooks that are perfect for all forms of classic hip-hop, neo soul or RnB. Inspired by the vibes of Anderson Paak, Erykah Baduh, Jordan Rakei and Tom Misch, each loops has been expertly crafted to work in a plethora of different ways. From filling out that low mid frequency band to adding pace and movement, working as an inspiring song starter or creating the prefect hook this beautiful guitar driven sample pack will instantly become a sample favourite. So, if you're looking to add some class and quality to your next track then take this one for a spin.. it's a beauty!